BB can mean lots of different things (e.g., "baby; beeper; bellyaching") in various Sinitic topolects and in Chinglish. Is it absolutely mandarin or is there a Cantonese reading that works here? Has Cantonese been driven out of the public sphere already in such contexts? 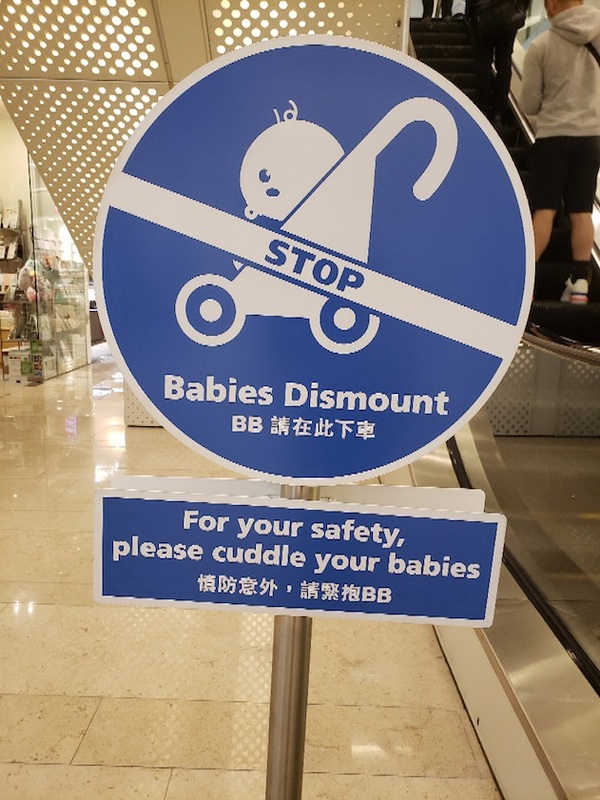 I think signs saying "For your safety, please cuddle your babies" should be widely used over here. @Nick Gupta Cantonese signs can still be seen near escalators in HK. A common one is "握扶手，企定定". 1) Cantonese has not been "driven out" of the public sphere in this context, as such signs would traditionally not have been written in Cantonese in the first place. 1a) cf. @hwu's comment where the escalator sign is relatively new and uses Cantonese (alongside the cute typeface and pengiun) in an attempt to be more relatable; when the MTR first opened I'm sure similar signs would have been in formal written Chinese using a standard font. >> I take issue with hwu saying that Cantonese signs can "still" be seen, I think they are more common than they used to be. 2) BB has a Cantonese reading – something like bi4bi1. I don't know how/when BB would be used in Mandarin. 2a) Writing BB instead of, say, 嬰兒 makes the sign "more" Cantonese to me. 2b) I don't know about other people but I subconsciously convert the 下車 to Cantonese 落車 when reading it in my head. Inserting obligatory "but will they stick the landing?" comment here. Bratschegirl's "stick the landing" comment inspired a train of thought on which I would seek other's advice. I had never previously encountered "stick the landing", so searched for it on Google and learned its current meaning. Having learned its meaning, I then began to wonder (a) how it entered some people's idiolects (but not others'), and (b) more generally, what are the pressures that cause some people (but not all) to adopt modern idioms and expressions with such enthusiasm and alacrity ? I can honestly say I have never felt in the least impelled to describe anything as "awesome", I have never used "yours" or "mine" to refer to someone else's home or my home, I have never wanted to "chill out" (or even just "chill"), I have never considered writing "gonna" or "wanna" for one second, and so on, yet these expressions and/or spellings are now in such widespread usage that not a day passes without my encountering one or more. Why is it, I wonder, that some people (I suspect the majority) are so keen to adopt the latest vogue words / phrases / expressions while others (such as myself) are so resolutely resistant ? My own working hypothesis is that, like so many things, the variance is due to combination of nature and nurture. The critical factors are probably; the degree to which one feels the need to signal group membership and social status by conforming to the normative behaviour of the group, and the degree to which one is able to do so. The "nature" elements would be aspects of personality and cognition which affect one's ability to comprehend social behaviour, pragmatics, figurative language, etc., and ones receptiveness and adaptability in the face of novel concepts and social contexts. The "nurture" elements would be such things as the degree to which social groups utilise shibboleths in determining one's acceptability, the severity of censure for behaviour not perceived as normative by the group, etc. The two categories will no doubt interact in myriad ways. I can offer no professional credentials to support this analysis. However, as an autistic person, I often find myself having to use cogitation as a substitute for social instincts before I open my mouth (I am rather prone to faux-pas if I don't! ), so one could say that I have "given a lot of thought" to the subject. @Philip Taylor: "stick the landing" is part of my vocabulary because of a fondness for watching televised competitive gymnastics (and for engaging in very elementary study of same when I was a great deal younger and more agile). "Sticking the landing," i.e. finishing one's dismount from an apparatus cleanly, is of great importance in gymnastic competition because it's the final impression one leaves with the judges. Outside of the arena of gymnastics, I rarely encounter the term "dismount," so "stick the landing" is an instant, Pavlovian response to hearing it. BG — Ah, for me, "dismount" is what we equestrians do several times a day ! I'm mildly surprised at seeing "awesome" on your list. Unless I misrecall, you're significantly older than me, and I still think of it as a good old word that was ruined by the Internet. I probably use it less often today than in the early noughts simply because an aversion to being associated with certain forms of online culture.